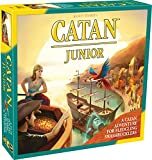 Seafarers is The Settlers of Catan's first expansion game and it adds Islands, Pirates, Gold, Ships, Islands and Trade, and expands your Settlers of Catan game in new directions. Similarly to the basic game, you play an immigrant on the newly populated Archipelago of Catan. Building settlements, roads, and villages by taking commodities from the land and islands around you. Turn a sheep, and some wood into a ship, bricks and wood into road, or try to complete other combinations for more advanced buildings and services. Take advantage of trades with other players, or at local seaports to get commodities you might lack. Colors are Red, White, Blue, Orange, Third Edition Compatible. Some scenarios may require two sets to play. In Cities & Knights Expansion, wild barbarians are attracted by the wealth of Catan and are gathering to attack. Dark clouds are gathering over the peaceful island of Catan. You have been given advance warning of their arrival and you must prepare for battle. To defeat the barbarian enemy, you must gather an army of valiant knights. The size of the barbarian army corresponds to the number of cities in Catan. Thus, for Catan to fend off the barbarian attack, the players must form a knight force as strong as the barbarian force. In addition to the barbarians, players compete to build the three great metropolises of Catan. Each of these magnificent centers are worth two additional victory points. To build a metropolis, players must invest in city improvements. To acquire these improvements, players must acquire the three new types of Trade Cards: Coinage, Paper, and Cloth. These cards can only be gained by building a city next to mountain, forest, or pasture hexes. In Traders & Barbarians Expansion, you can now play Settlers of Catan with only 2 players. There are new wooden pieces, a harbormaster, a friendly robber and special events. Explorers & Pirates Expansion includes 5 novel scenarios, each of which builds upon your previous experience. All are easy to learn, rich in character, and lots of fun. In each, you explore an unknown sea by ship and build settlements on the discovered islands. Scenario 1 ("Land Ho!"") 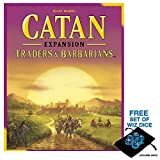 introduces you to valuable harbor settlements, shipbuilding, exploration, and overseas settlement—the most important basic rules of this expansion. Each subsequent scenario introduces a new mission and its simple new rules. The game culminates in Scenario 5 ("Explorers & Pirates"), which incorporates all of these very rich new themes in a diverse and exciting campaign of bold exploration and piracy! In Starfarers, you compete for the prestigious post of Ambassador to the Galactic Council. To attain this lofty position, players must leave Terra and the known planets to explore and colonize the galaxy, while working to establish trade with alien cultures, encounter aliens and defeat pirates. Glory and victory to the brave and astute explorer who luck smiles upon. The known worlds lie at one end of the game board where each of the 3 or 4 players begin from known solar systems, each with 3 planets producing raw materials needed for the travels into deep space. Each player begins with 2 Colonies and a Space Port (all components are made from plastic). The Space Port makes starships to transport your new colonies and trade posts to distant lands. Throughout the game all the colonies and spaceports enable the production of resources when the dice match the numbers of adjacent planets. Resources are traded for colony ships, trade ships, and fleet upgrades of freight rings, booster rockets, and cannon. Beware as you explore, some planets are covered in ice, and some conceal dangerous pirates. This game contains a myriad of components Each player has a 13 cm tall Mother-ship upon which your star ship fleet enhancements are placed. This mother-ship contains the traits for all of a players starships, as well as being the random generator of encounters and movement points. There are more than 200 other plastic components - colonies, trading posts, and space port rings for all four players, booster rockets (to speed your ships on their way), cannons (to defeat pirates), freight rings (to assist in placement of trading posts & colonizing ice planets, and glory rings (which give represent fame from acts of bravery). There are 4 Alien races and a assortment of Alien Friendship cards flavored to the individual races, 5 types of commodities cards, the wonderful Encounter cards deck, 4 player reference cards, 4 victory point markers, 4 alien tokens, 2 dice, 1 quick start rules sheet, a basic rules book, a detailed almanac, and last but not least those wonderful Spaceships. The mother ship features a random generator incorporated into the hull. This generator contains 4 colored balls, of which two are visible through a small dome on the bottom of the ship. The balls are red, yellow, blue, and black in color. The two visible balls will determine the speed of a players star ships and if an encounter card must be enacted. The first player to reach the victory point level wins. In Starship Catan, two Starfarers from the Catan space fleet have been thrown through a mysterious wormhole into an unknown galaxy. Lost, dazed and unable to find their way home, and with limited resources, the brave explorers face a seemingly hopeless situation, until they meet four peaceful alien races. These friendly aliens offer them limited aid and will guide them home if they can meet the high standards required for entrance into the Galactic Advisory Council. Now you can take the role of a Starfarer and daringly brave the unknown reaches of space! Battle dastardly pirates, explore & colonize new worlds, strike vital trade agreements, performing missions of mercy, rescues, and interventions, all while improving and preparing your Starship for the journey home. If you work hard, choose your course carefully and with vigor, you will attain membership in the Council and learn the way home.